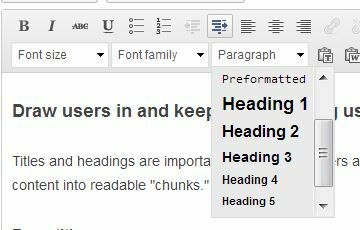 Your WordPress theme has styling tags that can be applied to your web page heading titles and headlines in the visual editor. Make sure your headline is understandable out of context. Headlines are often the only line people see in an RSS feed or in a mobile phone browser so avoid using creative puns or clever headlines. Tip: Scan your page by reading only the headings. If you can understand the flow and content, your headings are well-constructed. If it’s confusing, try rewriting your headlines and adjusting the order of your paragraphs. Subheadings provide an extra level of organization within a section. For example, if your heading is “Workshops,” you may need subheadings to group the various workshops by interest. Following these tips on formatting website titles and headings will organized your content allowing readers to understand what you are writing about. To view what headings would look like with your Artbiz theme please view the style sheet.